It’s that time of year, engagement season! Have you recently been engaged? Are you looking for the perfect gown for a great price? At “I do” Bridal & Tux, we have exactly what you are looking for, we have a large selection of dresses available at our first annual sample sale.The sale will be held Saturday February 20th and Sunday February 21st, normal business hours. Brides-to-be are invited to line up early for a selection of more than 150 wedding dresses marked down 50% to 85%. Gowns start as low as $95.00 up to $699.00. There will be dresses from all of your favorite designers; Watters, Wtoo by Watters, La Sposa, Blue by Enzoani, House of Wu, Sincerity & Sweetheart by Justin Alexander. This really is the sale to end all sales. We love our gowns and treat them with the best of care, so you can be assured you are getting your dream dress at a coveted price.Though we are taking appointments prior to the event if you come the day of there will still be a chance to find an appointment, it will be first come first served, once the appointments are all filled up we will start a wait list and call you when a time slot opens up. We want to be able to get you in your dream dress as quickly as possible. And just because it’s a sample sale, it doesn’t mean you’re on your own. Each bride will get an experienced consultant from start to finish. Our consultants know all the gowns (by name, and inside and out), all the tricks, and how to make sure you are beyond thrilled. Only four gowns can be initially selected, please bring any undergarments that would make you comfortable. We have listed all dresses in the sale along with pricing and style, on our Facebook page titled Winter Sale 02/20/2016-02/21/2016. We encourage each bride to go through the list. This will help your selection process during the appointment be much easier. Arrive at least 10 minutes before your appointment: if you are more than 10 minutes late your appointment will be given to the next bride. No holds and all sales final – come ready to buy! Only four dresses in the dressing room at a time. Consultations will be limited to 40 minutes. Wichita Bridal Shows is excited to be serving the Greater Wichita Area with our Expo for the 20th consecutive year! We present the largest showcase of wedding and event-oriented businesses in the state of Kansas; drawing both vendors and attendees from not only Wichita, but Hutchinson, Salina, Derby, Pratt, Emporia, El Dorado, Maize, Arkansas City and McPherson as well. Over 250 booths are available for interaction with the thousands of attendants each and every show. 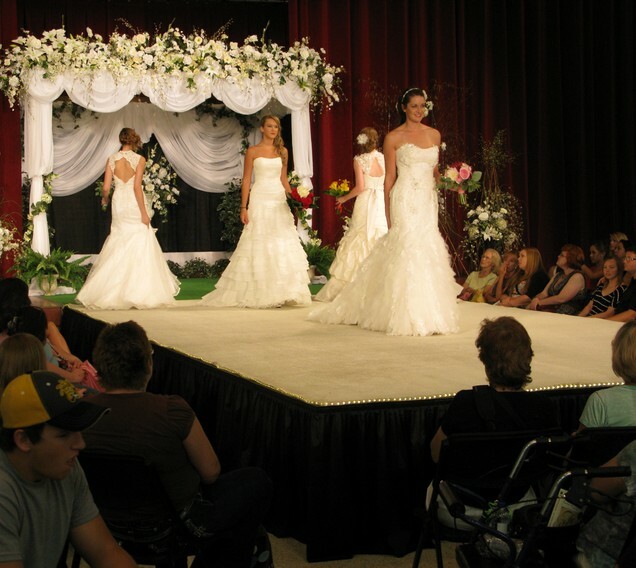 In addition to our stellar selection of vendors each year, Wichita Bridal and Event Expo offers the biggest Wedding Fashion Stage Show in Kansas, produced by Models and Images. It features exquisite set design, the latest in bridal,Quinceanera and prom fashions from 8 different bridal stores, and incredible floral arrangements by several of the area’s premier florists, all showcased by professional models and set to upbeat, exciting music professionally arranged. It is truly beyond explanation, and has grown into an all-inclusive any-event show!Because of the variety offered at each of our shows, people return for the shows each year. Another exciting new feature of the shows are our incredible full-event and reception setups, plus participation in wine education with sampling, interactive catering stations and much more! These showcase events feature the latest in trends and features in event design. The show is evolving, changing, and even more exciting! Visit I Do's profile on Pinterest.